....Breakfast for every meal of the day! Cut the top off the bread rolls and remove the bread from the middle. Butter the bread roll lids then cut them into soldiers. Spread a layer of crème fraîche onto the bottom of the rolls, and fry the bacon then place into the rolls as well. 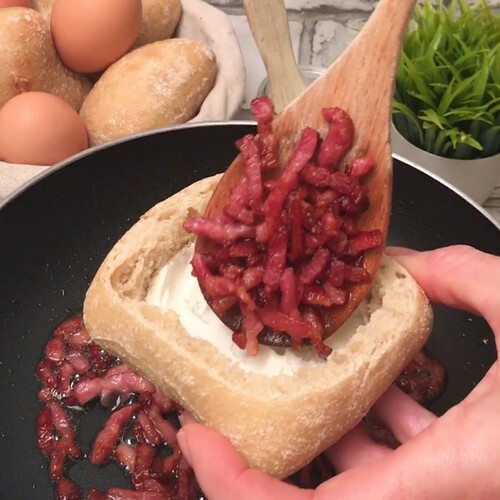 Add grated mozzarella on top of the bacon and then break an egg into each roll. Put the rolls and the bread sticks into the oven for 10 minutes at 180°C on a baking tray. Remove the rolls from the oven, season with salt and pepper and sprinkle with chopped parsley. Enjoy by dipping the toasted breadsticks into the cheesy and eggy bread roll centre.